Go hunting for treasure at the bottom of the ocean in Charms of the Sea. 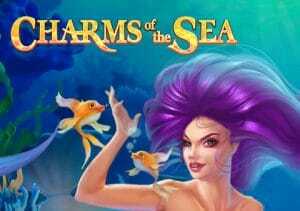 Created by Playtech, it’s a 5 reel, 20 payline game that comes with mermaid symbols that can expand vertically and horizontally as well as respins with stacked, sticky and overlay wilds. Play on all devices from between 20p and £500 per spin. The design here is done cartoon style and works rather well. The lower value symbols are 4 different coloured pearl shells. They’re joined by sea horses, goldfish, crabs and octopuses. 5 octopus symbols on a payline will get you a 37.5 times bet reward. Helping to create those elusive winners is the purple jewel which is wild – it offers payouts of 2, 37.5 or 500 times your bet if you land 3, 4 or 5 on a line as well as replacing all other symbols. Look out too for the mysterious mermaid – if she appears in silver or gold edged symbols alongside other mermaid symbols, she can expand horizontally and vertically into 2×1 and 2×2 symbols. Land 4 mermaids on successive reels, 2 of which are edged in gold, and the mermaid transforms into a massive 5×3 symbol, fills the reels and delivers a payout of some 250 times your bet. This is known as the Mermaid Expansion feature. Stacked Wilds feature – look out for the ray of light that can appear above reels 2, 3 or 4. It will land over 1 of them and turn it into a stacked wild. A respin then follows. You could end up with 3, 6 or even 9 extra wilds here. Wild Chunks feature – a ship’s wheel appears on the screen when this triggers. Give it a spin. The pointer will land on a 2, 4, 6 or 9 segment. That’s how many overlay wilds are then added. A free spin then follows with all of your new wilds added. Sticky Wilds feature – you’ll receive 3 sticky wilds on the middle 3 reels when this triggers. Respins then follow which can add even more wilds into play. Get the maximum 9 extra wilds and a bumper payout could be heading your way. We enjoyed Charms of the Sea. The simple, cartoon-style design works well and the soundtrack is a catchy one. The undoubted highlight are the trio of wild extras. These come along at regular intervals and more than make up for lack of a Free Spins feature. We’ve seen flashier seafaring video slots than Charms of the Sea. With all its wild extras and expanding symbols, this game lives up to its name and is a right little charmer. If you would like to stay in water, IGT’s King of Atlantis and ELK Studios’ Wild Seas are worth trying.